Four Bean Chili is my new favorite chili recipe. The secret is adding refried beans. This fourth bean adds incredible depth of flavor, a wonderful texture, and makes the chili taste like it's been simmering for hours. Top it with sour cream and some shredded Cotija cheese. I love serving chili on cold winter nights. There's really nothing more warming You can make this chili as spicy or as mild as you'd like. If you like really spicy foods, add some minced jalapeno or habanero peppers, or add crushed red pepper flakes or cayenne pepper. If you prefer milder food, make the recipe as it is written. Add the onion and garlic; cook and stir until tender, about 5 to 6 minutes. Stir in the refried beans, diced tomatoes, tomato paste, and 1 cup of the broth; stir until beans and tomato paste dissolve. Stir in the remaining broth along with the chili powder, cumin, pepper, and salt if using. Then stir in the black beans, navy beans, and kidney beans. 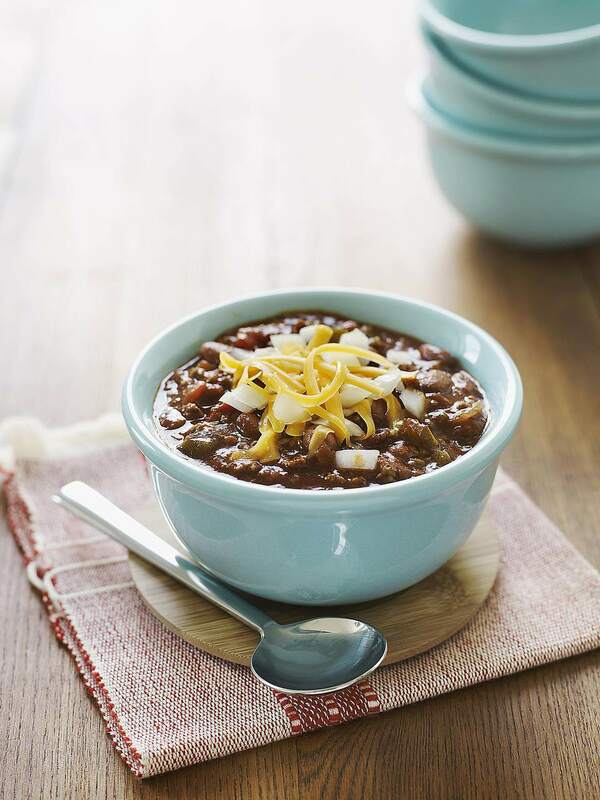 Bring the chili to a simmer; reduce heat to low and simmer for 15 to 20 minutes, stirring frequently, until the chili is thickened and blended.